by Kornel Lesiński Co-owned by Dylan DPC, rust-bus. This is a lowest common denominator struct for working with image fragments in Rust code. It represents a 2-dimensional vector and rectangular slices of it. In graphics code it's very common to pass width and height along with a Vec of pixels — all as separate arguments. This gets very repetitive, and can lead to errors. This crate is a simple struct that adds dimensions to the underlying buffer. This makes it easier to correctly keep track of the image size and allows passing images with just one function argument instead three or four. Additionally, it has a concept of a stride, which allows defining sub-regions of images without copying, as well as padding (e.g. 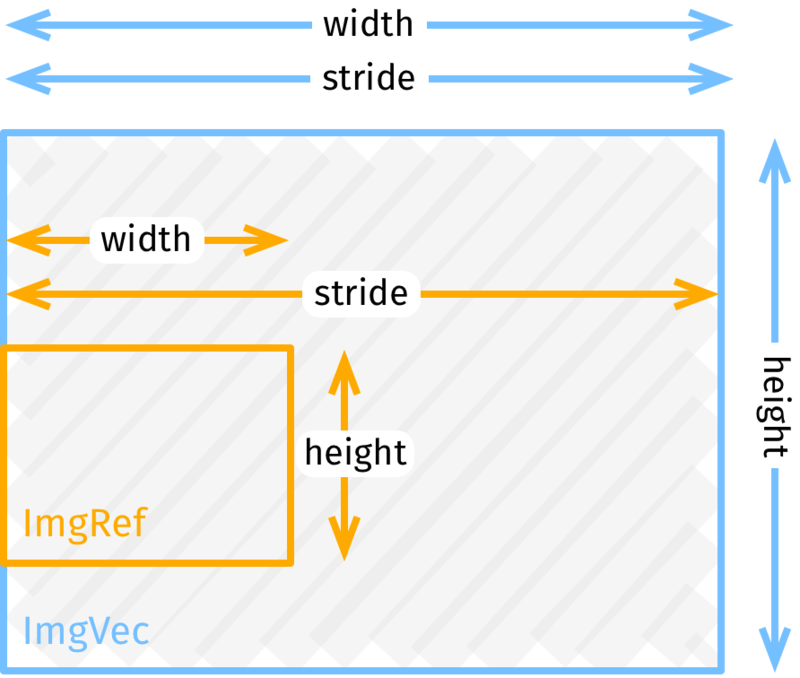 buffers for video frames may require to be a multiple of 8, regardless of logical image size). For convenience, it implements iterators for pixels/rows and indexing with img[(x,y)]. These are described in more detail in the reference. It owns its pixels (held in a Vec). It's analogous to a 2-dimensional Vec. Use this type to create and return new images from functions. ImgRef is a reference to pixels owned by some other ImgVec or a slice. It's analogous to a 2-dimensional &. Use this type to accept read-only images as arguments in functions. Note that ImgRef is a Copy type. Pass ImgRef, and not &ImgRef.